Perhaps you’ve spent hours online searching for the best food dehydrator and just got confused with all the products being peddled, and the technical jargon used doesn’t help either. I was faced with the same problem before and that is why I decided to do these comprehensive reviews and guide. 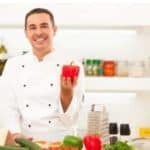 I have covered the pertinent features of each product, and I have also included information about food dehydrators in general so you’ll know what to look and not get confused by any technicalities used by the vendor. 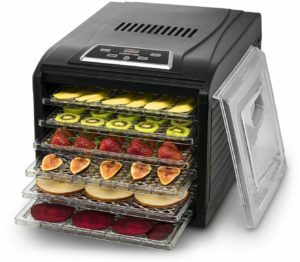 The Snackmaster Pro allows you to dry fruits, jerky and vegetables quickly thanks to its proprietary Converga-Flow drying system that pulls air in the exterior pressurized chamber. The air is then set along the individual trays horizontally and meets in the center for quick and even drying. I also like the Snackmaster fan so you don’t have to worry about the heater chamber getting wet. It also has got the proprietary Vita-Save exterior that keeps harmful lights out so all the essential vitamins, minerals and nutrients are maintained during the drying process. The 700-watt Snackmaster comes with five trays but it is expandable to 12 (sold separately) if you want to dry large volumes of food. The Snackmaster doesn’t scrimp in the accessories department either with three jerky packets and a couple of Clean-A-Screen screens for drying spices and herbs. Two fruit roll sheets are included too. Measuring just 13 by 13 by 10-inches, the Snackmaster is sleek and compact. It is easy to use but has enough power to dehydrate a wide range of fruits, beef jerky and more. As customers have also noted, the Snackmaster is also good for making apple chips, chicken jerk and bacon bits. The Excalibur 3926TB comes bundled with nine trays and an adjustable thermostat for precision drying. I also find the 26 hour timer convenient to use. The thermostat has a range of 105 to 165 degrees, more than enough to conserve the nutrients in spices and herbs for dehydrating jerky. I looked over the design and noticed the heating elements, the fan and the thermostat are in the back of the Excalibur so cool air is pulled in, heated up and distributed uniformly over each all the trays. The Excalibur also sports the proprietary Parallex Horizontal Airflow system that dehydrates food rapidly while making sure all the essential nutrients are kept. What I like about the Excalibur is the way it allows me to dehydrate food without the need to rotate the tray and affecting the taste. You can also remove the tray and use it for preparing other types of food. Of all the features on the tray I am most impressed with the Hyperwave Fluctuation Technology as it keeps the temperature low enough for the enzymes but high enough to dry the food for just the right balance. The GFD1650B was built from the ground up to simplify drying of food as drying time goes up to 19.5 hours and can be adjusted in increments of 30 minutes. You can set up the GFD1650B to dry from a range of 95º F (35C) To 158º F (70C) so the results are accurate and just the way you want it. One of the most impressive features here is the Cuircusmart 360 Air Flow Circulation Technology as it does the drying up work without the need to rotate the shelves, and it gets the job done without generating a lot of noise. 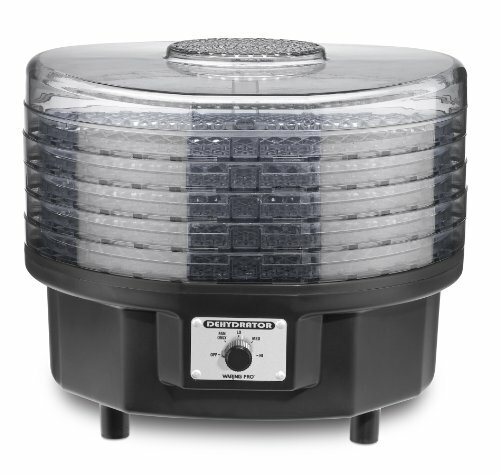 This is also one of the more spacious dehydrators I have seen: each level can support up to a pound of food and I can use it for everything from fish, fruit, veggies, poultry, meat and more. The GFD1650B has 400 watts of drying power, and combine that with its quality and speed and you’ve got one of the finest food dehydrators today. Last but not the least the dehydrator does an excellent job drying food without affecting its nutrient value. The FD-1040 product description says it is digitally controlled and following our tests I have to agree. The built-in fan ensures no liquid gets into the heating chamber, and you can expand the four trays up to 20 if you want to dry large volumes of food. If you do opt for this option you’re not going to be disappointed as its 1000 W power is more than sufficient. The highlight here for me is the Converge-Flow feature as it draws heat down in the specially built chamber. Once sufficient heat has been generated, it is then released and spread evenly among the trays to ensure nutrients are preserved. It also helps that the fan is 4-1/2 inches and helps dry food quickly. The product claims the FD-1040 is up to four times faster than your regular dehydrators, and I can say this is true. The reason for its speed is the fan. Just to give some idea of how quick the FD-1040 is, it only takes 4 to 6 hours to dry pineapple, apples 4 to 6 hours and beef jerky also 4 hours. With a thermostat that can be adjusted from 90 to 160 F, you’re in full control. 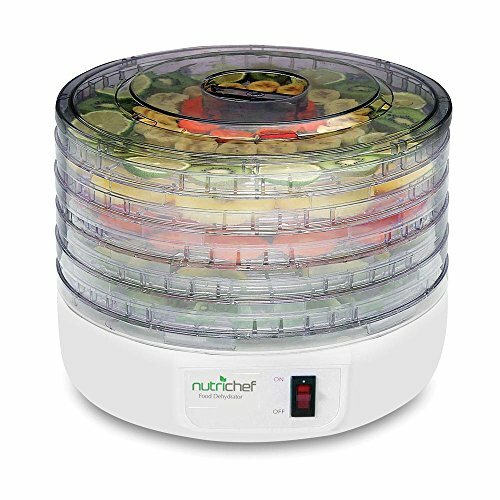 The NutriChef dehydrator has a lot of features, but if I could only point out one, it would be its ease of use. Just place the food you want to dry, press a button and the NutriChef will do the rest. 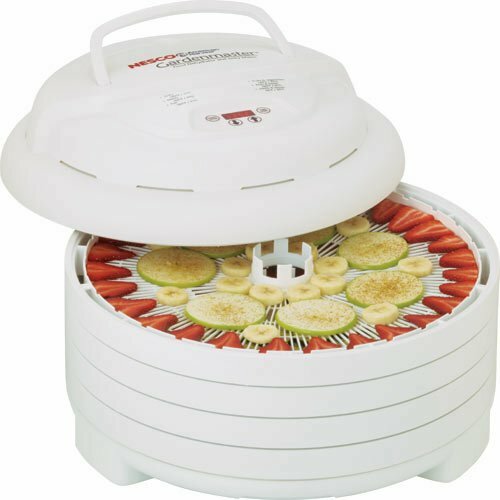 What this food dehydrator does is eliminate the moisture, drying the food while preventing spoilage. The NutriChef comes with several trays, and the multi-level design allows for faster air flow, effectively dehydrating your food and making sure it lasts longer without any additional preservation. You’re probably used to freezing or canning food to preserve them, but dehydration is far more effective and it doesn’t affect the taste or quality. Another advantage is the nutritional value isn’t diminished and for all its features the NutriChef remains easy to use. Once the maximum temperature of 180 F is reached, food is dehydrated and shrinks, allowing you to store it in the NutriChef. There are 5 stackable trays included, and its design allows for greater air flow and rapid dehydration. Aside from food preservation you can use the NutriChef to make healthy snacks and gives you healthier food options. 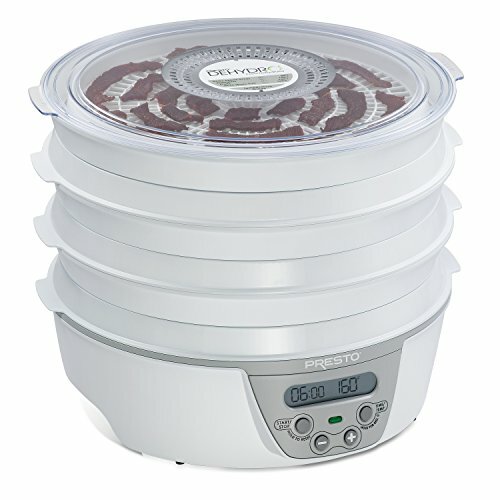 The Presto 06300 is notable for its expandable four-tray system that dehydrates jerky, fruits and vegetables for preservation and homemade treats. At just 7.2 lbs. the Presto is one of the lightest food dehydrators today, and the power cord storage provision is a nice touch. The trays also stack up nicely and don’t eat up a lot of space. The cover is see-through, allowing me to view what’s going on inside. Constructed from transparent polycarbonate, it’s now possible to see what’s happening with your food without removing the cover. The 06300 comes with a bottom mounted fan that follows traditional designs but does a much better job of managing and distributing heat across all the racks. 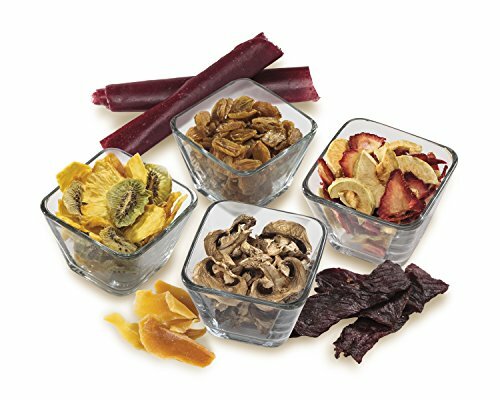 When it comes to dehydrators, it is all about heat distribution and this does not disappoint. The Presto has a compact design and the wide range of temperatures it can generate increases its versatility. With 600 W of power the Presto is capable of dehydrating different types of foods without difficulty. Furthermore, the Presto components are dishwasher safe so it is not going to give you problems with cleaning and maintenance. The FD-37A differs from the other food dehydrators by its speed and power. With 400 watts of power the FD-37A makes short work of vegetables, fruits, beef jerky and more, and its construction conforms to Nesco’s commitment to being green. There really isn’t a lot of adjustment required here as the temperature is preset to 160 degrees, which is exactly what is needed to dry fruits, vegetables and jerky. The FD-37A is equipped with the patented Fan Flow Radial Air that ensures all the foods are dried evenly on the trays, and you can do this without having to rotate any of the trays. 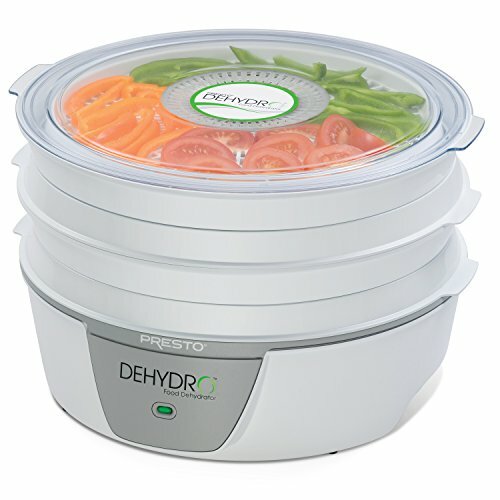 Like the other food dehydrators here, the FD-37A has a clear, transparent top so you can keep an eye on the drying procedure. The FD-37A also comes with plastic side clips that fasten the trays for convenient storage and transportation. With the FD-37A you only have to wait a few hours to finish the dehydration process rather than days. Upon purchase, the FD-37A comes with 4 trays, but you can expand this to 7 by buying more. 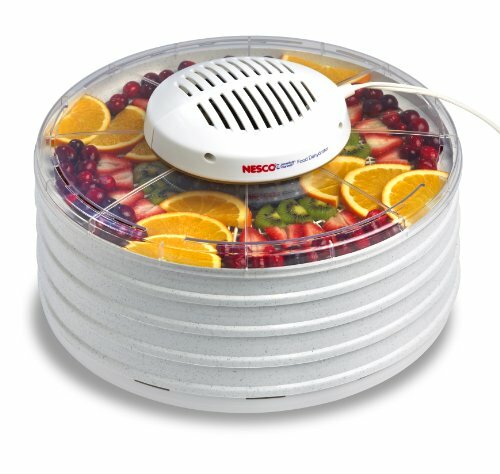 This only goes to show how versatile this food dehydrator is. The Pro DHR30 is most ideal for herbs, jerky, fruits and vegetables, and this is the due to its specially designed heat distribution system. The Pro DHR30 has a top venting system that sets air horizontally across all the trays. Compared to vertical air flow, air that flows horizontally makes even drying certain and thus away with the need for repeated rotation. With poorly designed food dehydrators you have to constantly open the unit to check if the food is dry, and that actually slows down the heating process. The good news is it won’t be an issue with the Pro DHR30 as it ensures heat is distributed evenly. The five interlocking trays are fully functional and serve as space savers, perfect if your kitchen counter is already stacked. Five trays are enough for most people but you can expand this up to 9 trays (sold separately). If you’re the type who likes to prepare a lot of food at once, then its expandable nature should be most welcome. Overall the Pro DHR30 is compact and should make it easy to handle and move around. The main feature of the 06301 is its six tray system which dehydrates foods quickly and more cost effectively than others. The drying system doesn’t use preservatives and simplifies the process of making jerky from meat, seafood and poultry. When you order the product it comes with cure and spice packets so you can get started right away. Aside from jerky, the 06301 is handy for preparing fruit rolls, herbs and other foods. 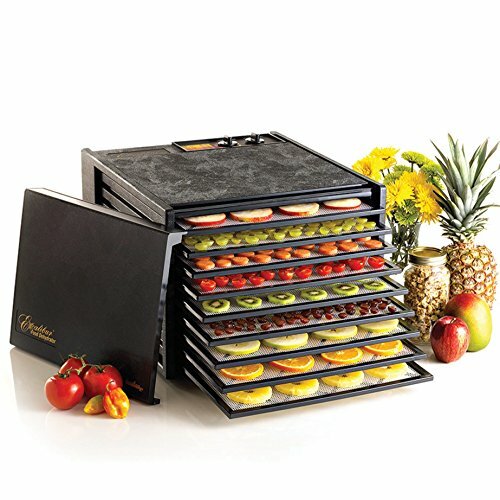 The dehydrator is completely digital for your convenience and comes with half a dozen trays. Like other food dehydrators from Presto you can purchase additional trays and double its capacity to 12, ideal if you prepare a lot of food. You can stack the trays when you’re done using them, saving you a lot of space on your countertop. And no matter what fruit, vegetable or meat you dry, its essential nutrients and vitamins are kept intact so you eat healthy food. The 06301 also comes with a couple of fruit roll sheets so you can make them from canned, frozen or fresh fruit. Two nonstick mesh screens are also provided so you won’t have a difficult time with sticky fruits and food. If you’re looking for an easy way to prepare healthy snacks the Hamilton Beach 32100A is a good option. 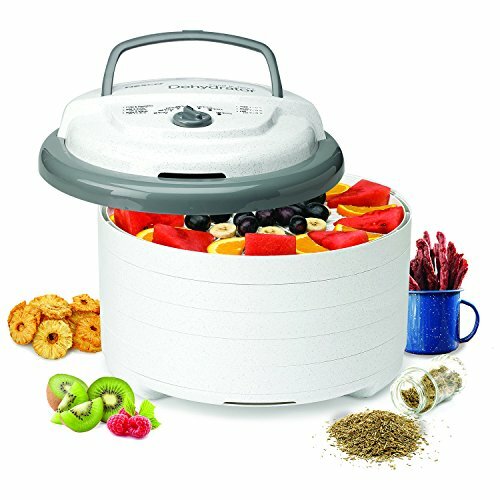 This food dehydrator is easy to use and gives you an alternative to the usual foods you’ve been eating. With 500 watts and five trays the 32100A is capable of handling whatever beef, poultry, seafood, fruits or vegetables you can throw at it. The 32100A has nonstop airflow so drying is uniform across all your trays. One of the most common chores you do with regular food dehydrators – rotating the trays – is not required here as the built-in heating mechanism ensures sufficient heat. As you might expect from a quality product, the thermostat is digital and adjustable, plus the auto shutoff feature is really convenient. The 32100A includes a couple of specialty sheets for enhanced functionality. I use the mesh sheet for herbs while the solid sheet is ideal for fruit rolls and puree. I also want to point out its lid is transparent so you can easily see what is going on. Why bother buying potato sticks or dried fruit when it’s easy enough to do it yourself? Here are the major factors you should consider. Food dehydrators have horizontal or vertical fans and use proprietary methods for heating and drying food. Between the two, choose the horizontal system because it ensures drying is even for each tray. Vertical fans heat quickly but only on the trays set lower. If you want food dried evenly choose a horizontal heating distribution system. Food dehydrators are available in various sizes. Stackable trays are ideal if space is limited on your countertop. What’s even better is most of them are expandable so you can buy extra trays and set them on top of one another. With this set up you can prepare more food without it occupying additional space. The majority of food dehydrators are expandable but others are not, so read the product description carefully. Food dehydrators are available with different price tags: some are aimed at budget users while others are for the high end market. The most expensive food isn’t always the most effective or practical so you need to consider your personal needs. On the other hand, settling for a cheap product could end up costing you more if it doesn’t come with the features you’re looking for. At the very least the food dehydrator should have a horizontal heating distribution system and a timer. All food dehydrators generally function the same way, and they set themselves apart from the rest with the extra features they have. But which of these features are necessary? This is a matter of personal preference but as mentioned earlier a timer and horizontal heating distribution system are necessary. Tray stacking option is necessary if you plan to dry several foods at the same time. Most food dehydrators also come with spice packets and fruit roll sheets. Here are a few more factors you should keep in mind. We already spoke of how stackable trays can save space, but we are talking about the physical dimensions of the food dehydrator itself. The physical specs are available online so you should check it out and make sure there is enough space on your countertop for it. This refers to how much you can modify the food dehydrator. These appliances usually run without a hitch: put the food in, press a button and it goes to work. However, some models have additional custom options so you have greater control. This is in a way related to the features consideration I mentioned earlier. While having numerous features is nice, it won’t amount to much if the appliance is hard to use. Food dehydrators are made of plastic or metal. If you are going to buy a plastic food dehydrator, make certain the material has FDA food certified grade and has no BFA. The same rule goes for metal: make sure the material used has been approved by the FDA. As to which is better, it really depends on the manufacturer. Generally speaking, metal is going to last longer, but they are heavier compared to plastic. Also, manufacturers have been coming up with different types of synthetic plastic so they’re stronger and last longer, so doing a bit of research won’t hurt. I suggest you try any of the ones here as they’ve got unique features and qualities. For the longest time we had no choice but wait days to dry fruits, vegetables and other food, but now it’s going to take less time especially if you have the best food dehydrator in your kitchen. If you’re after healthy food that doesn’t take forever to prepare, these products are exactly what you need.